Try adding a space between "17" and "LI".. Somebody posted a similar topic recently, and it seemed like LL's filters were picking it up as a disguised "loli." That was a simple one for a change. The algorithm that is supposed to catch naughty words still ahs a lot of quirks that don's seem to make sense to any human. I know of one texture maker with a name that is on the list of - not banned but at least A rated - words. I only found out when I used some of her textures for some of my works and tried to give her credit in the item descriptions. Yeah. That was a weird one. 17LI indeed. 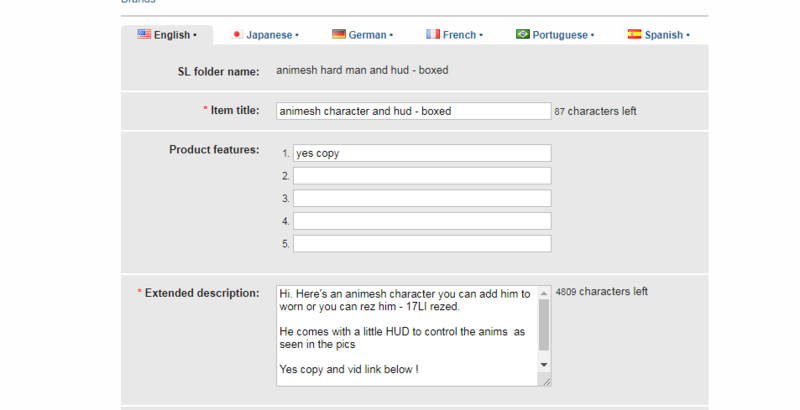 I lost an hour of my life editing and re-editing wondering wth was wrong before I turned to the forum to get help. 17LI would have been the last thing I would have tried. The ad would have said nothing but 17LI before I had finished. And would still have been rejected. Laughs perhaps slightly bitterly. My friend does'nt know what a disguised loli is either btw. My friend does'nt know what a disguised loli is either btw. "Disguised" as in changing the way the word is written so that word filters don't notice it. Kinda like how you would type swear words like f**k, or ag3pl4y. "Loli" just refers to a little girl, but rarely in a PG way. Kinda like how you would type swear words like f**k, or ag3pl4y. I don't! I never use such dirty words, disguised or not! Of course, my computer is always addign typos to my text and some of those can be, ummm... a bit embarrasing. But that doesn't c**t.
Very useful thread, I had no idea that the algorithm detected the disguised words too. I am pretty sure you found disgusting not innocent examples but I bet most were harmless and within TOS. I meant to post this earlier. A non-offensive use. I don't do embarrassing typos often, but the autocorrect on my tablet gets me so many times I should know better than to hit send right away. It's called "speculation" for a reason. Fact of the matter is that we - the general user base - don't know. Who does? Linden Lab does and they're not about to tell anyone what the flagging triggers are. Yes. And i just put forth some arguments arguing against those speculations. Not always. I've reported a couple of strange word filter behaviour to them and it's not at all unusual for them to be just as surprised as we are. That or the ones that set up the lists don't work at the Lab anymore - either case would have the same result. There is probably just a regular expression or two catching anything that looks like l33t speak. No you didn't. What you did was share some search results, those are not arguments arguing against those speculations, because the speculations are not absolutes, neither are your arguments. Ftr, this entire subject has been a massive issue since the inception of the MP. Yes , since day one, there has been a list and algorithms used against said lists, along with whatever other arguments LL has hard coded into the system, to search for "disallowed words". Never has LL released said lists, outside of some general information located in the MP selling guidelines. Never should any of us expect to know them, either. Many a word have set off both the banned word flag, and the "let's change the listing to adult" flag, the vast majority of the words are actually innocuous, in pretty much all forms, including l33t sp34k, which is what drives the vast majority of frustration towards LL in this arena. LL does not care, has almost stated as much by never addressing this issue. However we can all take comfort in knowing that the list(s) and programming utilized for this, are ever changing., and they are *never* consistent across the board. Basically that means while it may trigger flags for some listings, it won't for all. So, take comfort in knowing that even LL have no damn clue how the hell the whole thing works, either, and they never have. For a while, my name, Tari, set off the adult flag...then for a while, it set off the banned flag, now it no longer does(that I know of, who knows, it might again, hard to say, lol). As did words like hat, turtle, chocolate, the number 8...seriously, do a search of the forums, you'll find the previous discussions about this, they're kinda entertaining. Most of them are about the adult flag, versus the banned flag, but it's still applicable, it's all the same ridiculously terrible programming. Yes I did. The fact that speculations and arguments are not absolutes, has nothing to do with anything. The whole concept of absolutes here is totally irrelevant and meaningless. I can guess the origin of some of these!